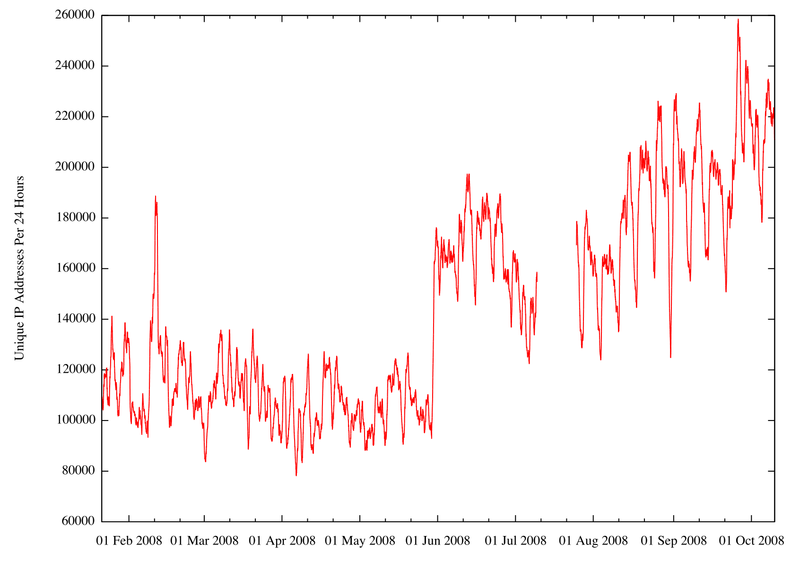 Figure 1: SenderBase spam volume (billions/day) for 2007-2008. At its peak, IronPort estimates that Reactor Mailer was responsible for 60% of global spam, as many as 80 billion messages per day sent by no less than 260k hosts infected with the Srizbi trojan. In this paper, we will argue that the increase in spam since June 2007 is not merely correlated with Reactor Mailer 3's inception, but was caused by it. We begin with a brief discussion of Reactor Mailer's architecture and why it enabled Reactor Mailer to send spam at such a high rate as compared to its peers. 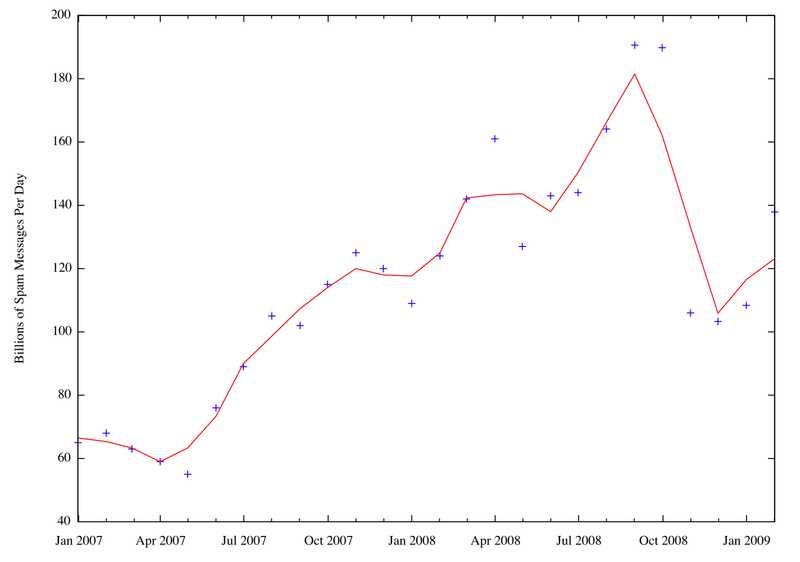 This is followed by lower-bound measurements of the size of the Srizbi botnet during much of 2008. We continue with a discussion of the hosting provider, McColo, that enabled Reactor Mailer to be so prolific. We conclude by relating the shutdown of McColo and the February 2009 Microsoft Malicious Software Removal Tool to the decline of spam and Reactor Mailer. According to Elphisoft's marketing material  and IronPort's own research, Reactor Mailer has been a cluster mailing system for at least two major revisions. Version 3 of Reactor Mailer moved the worker process from Elphisoft's data center to hosts infected with the Srizbi trojan. Figure 2: Life cycle of a Reactor Mailer spam campaign. The Reactor Mailer system architecture is illustrated in figure 2. When a Reactor Mailer user wishes to send a spam campaign, they create a "task" in the user interface and then instruct the system to run the task. The Reactor Server then separates the task into indiviudal work units called atoms. Each atom contains message templates, data files and email lists. Workers request atoms from the Reactor Server, process the work unit by sending the emails and then report the completion of the work unit to the Reactor Server. 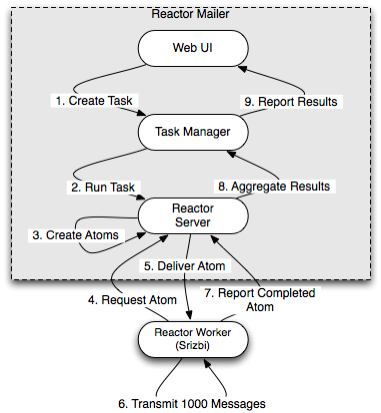 The Reactor Server aggregates the results from the workers and reports the status of the task through the user interface. Moving the worker processes from the data center to infected hosts eliminated Reactor Mailer's main bottleneck: communication with and maintenance of large numbers of SOCKS proxies. Previously, all of the spam was generated in the data center and transmitted byte-for-byte through the data center's network connection. By running the worker process on infected hosts exponentially increases the amount of available processor power and network bandwidth. Combined with a sufficiently large pool of infected hosts, this allowed Reactor Mailer to transmit spam at an unprecedented rate. The Srizbi trojan is a very stealthy piece of malware. It is implemented as a kernel-level driver, attaching itself to the NTFS system to hide its files from the Windows kernel and the user. It also attaches NDIS and TCP/IP drivers to evade firewall and sniffer tools. Researchers at IronPort have also observed that the malware stops sending spam whenever the user touches the mouse or keyboard, presumably to prevent observable network latency. At its inception in mid-2007, Srizbi was being distributed using drive-by downloads by exploited sites linking to the MPack toolkit. In February 2008, as the US Presidential primaries were heating up, Srizbi was distributed by email using web links to executables posing as videos of candidates such as Hillary Clinton. Email lures continued through mid-2008, with a highly successful campaign in June purporting to contain a video where the user looks "stupid." 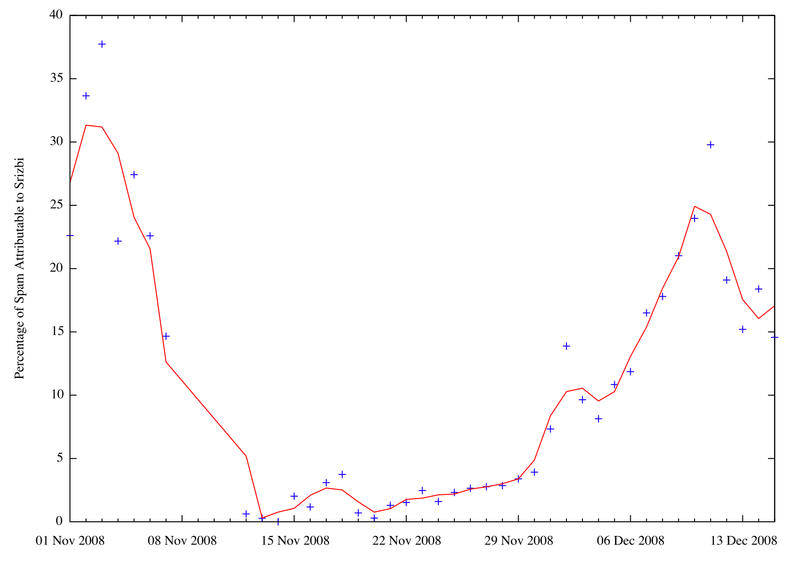 Spikes in spam volume and botnet membership and corresponding to the February and June 2008 campaigns can be observed in figure 1 and figure 3. Figure 4 focuses on the social engineering campaign in June. The p0f passive OS fingerprinting tool  uses six features to generate a fingerprint of a TCP packet. Initial time to live (TTL). Whether or not the "Don't fragment" (DF) IP option is set. Total length of the IP and TCP headers. Number and order of TCP options. Quirks in the TCP/IP implementation. Srizbi's TCP/IP signatures stand out from those of every other implementation in p0f's fingerprint database and IronPort's investigations suggest that they are unique. While not a discriminator on its own, the DF bit being set to 0 is very rare among modern TCP/IP stack implementations. The earlier version of Srizbi set the maximum segment size to the lowest allowed by RFC 879 . Both versions of Srizbi use a constant initial window size. The maximum segment size (MSS) varies when the user connects to the internet with PPP over Ethernet (PPPoE) and uses a broadband router that reduces the maximum segment size by 8. This is done because the maximum transmission unit (MTU) for Ethernet is 1500 and the MTU for PPPoE is 1492, although with such a small MSS, it is unnecesary to do so. The MSS of 536 corresponds to an MTU of 576, the default IP maximum datagram size in RFC 879. Throughout much of 2008, IronPort captured a sample of incoming TCP SYN packets to the SpamCop spam trap system from which those packets originating from Srizbi-infected hosts were extracted. The number of unique infected IP addresses observed per 24-hour period is plotted in figure 3. This figure is a lower bound because it only includes the IP addresses that were seen by IronPort's sensor. This figure should be corrected by the probability that a given Srizbi host would send email to SpamCop within a 24-hour period and by the sampling probability. The former is unknown at this time but could be derived using statistics about the contents of distribution lists in use and actual rate of spam transmission by Reactor Mailer, should they ever become available. Figure 3: Lower-bound estimate of the number of hosts infected with Srizbi throughout 2008. The McColo data centre facility was located in Market Post Tower, 55 S Market Street in San Jose, CA. McColo was notorious as a haven for botnet command and control servers and online pharmacy payment processors, among other unsavoury activities. McColo purchased network connectivity from Global Crossing and Hurricane Electric. Reactor Mailer appeared to be McColo's largest single customer, occupying at least 27 addresses on the 208.72.168.0/23 netblock. Reactor Mailer leased at least 25 unique servers running Linux 2.4.20 on Itanium. Each of these servers had its own pool of workers and was, presumably, leased to different sets of customers. 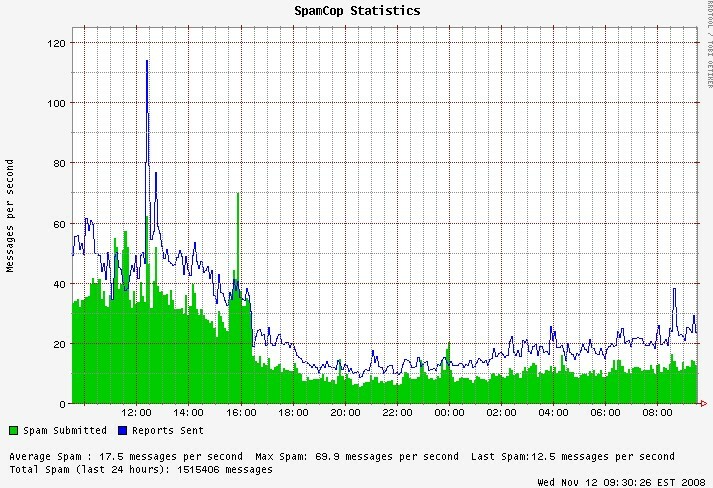 Figure 5: SpamCop volumes dropping off by two thirds after the McColo shutdown. It took Reactor Mailer two weeks to relocate to Estonia  and resurrect their servers using a domain name generation algorithm. Unsubstantiated rumours suggested that Elphisoft was able to recover their servers from the McColo data centre. Reactor Mailer's recovery can be seen in figure 6. Figure 6: The percentage of spam attributable to Srizbi around the time of the McColo shutdown. By early February, 2009, Spam volumes were back to their pre-McColo shutdown levels and Reactor Mailer was once again accounting for 60% of spam. 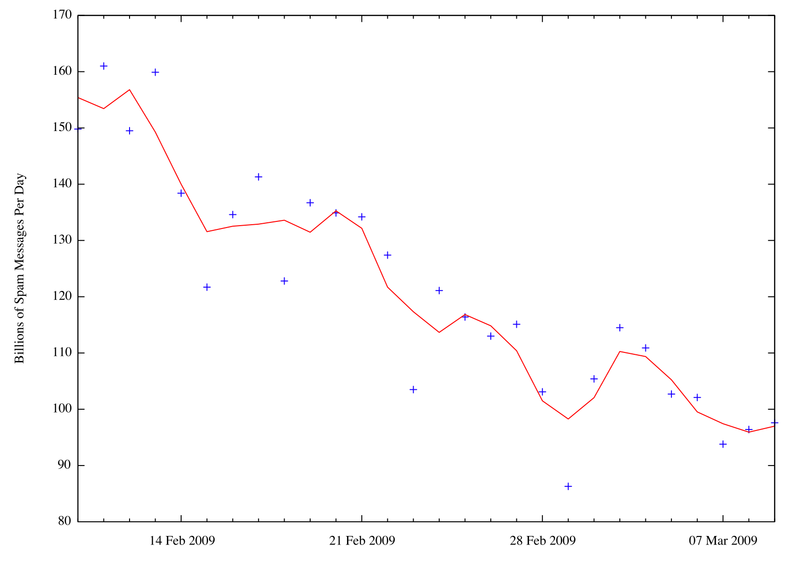 Figure 7: The percentage of spam attributable to Srizbi around the time of the February 2009 MSRT release. 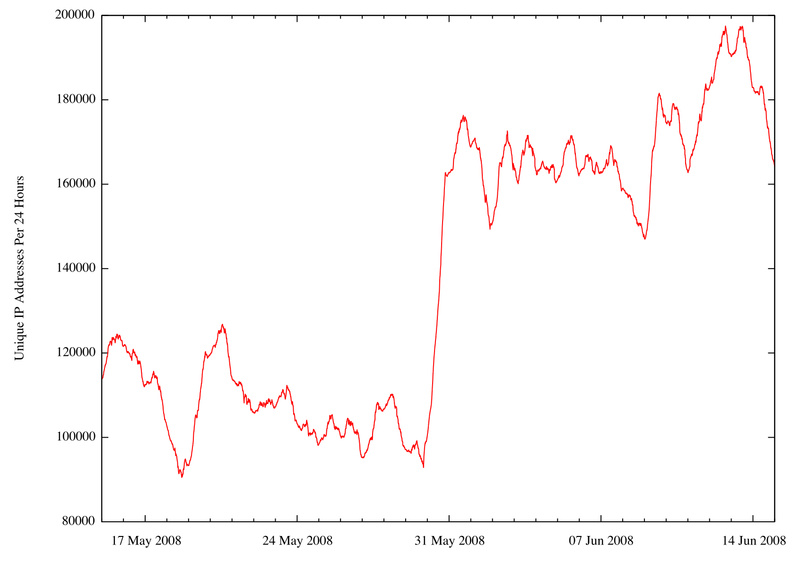 With Srizbi nearly eliminated and Reactor Mailer all but shut down, spam volumes quickly returned to the levels of June 2007, as shown in figure 8. 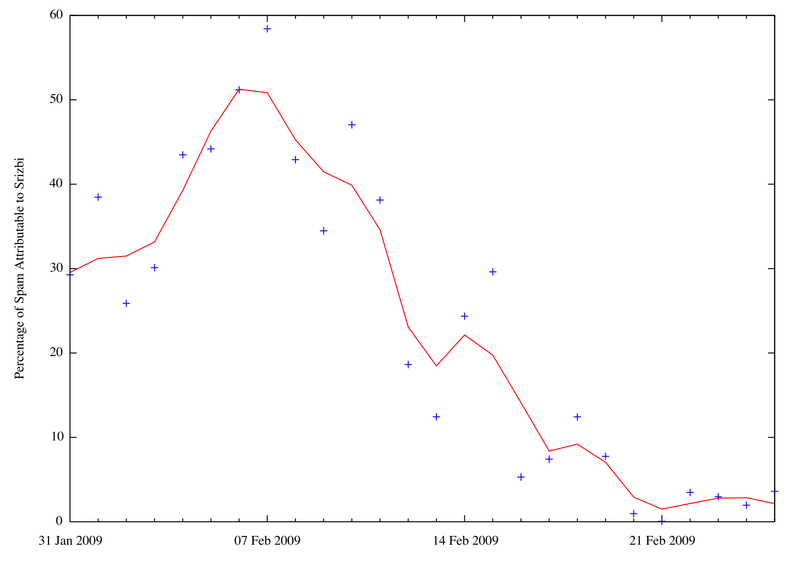 Figure 8: SenderBase spam volumes dropping to early 2007 levels following the February 2009 MSRT release. We have demonstrated how Reactor Mailer's modern architecture enabled it to transmit spam messages at an unprecedented rate. We have connected several significant events in spam from June 2007 through the present to events involving Reactor Mailer. Spam volumes increased dramaticaly when Reactor Mailer 3 and Srizbi were first deployed and dropped to the original volumes both times that Reactor Mailer was disabled. Whenever the Srizbi botnet was expanded using a successful social engineering campaign, global spam volumes increased. We can therefore conclude that Reactor Mailer was responsible for a 19-month global increase in spam volume between June 2007 and February 2009. The McColo shutdown and MSRT update were both effective methods of crippling the Reactor Mailer system's spam transmission capacity and had noticeable effects on global spam volumes. While it is still too early to draw any conclusions about the long-term effectiveness of the MSRT update, the effects of shutting down the command and control infrastructure of the botnet were only short-lived. While it seems easier to affect change by targeting a botnet's command and control server while leaving the rest of the botnet intact, it is demonstrably not an effective long-term method of stopping spam and mitigating botnets. Further study of the long-term success of cleaning up infected hosts at mitigating botnets is required. Until a practical, permanent solution to this problem can be devised, both tactics should continue to be employed in concert with other botnet and spam mitigation techniques presently in use.